Happy Aether Tuesday, Voyagers! This week we want to get some feedback and see what you think of what we have going on here. 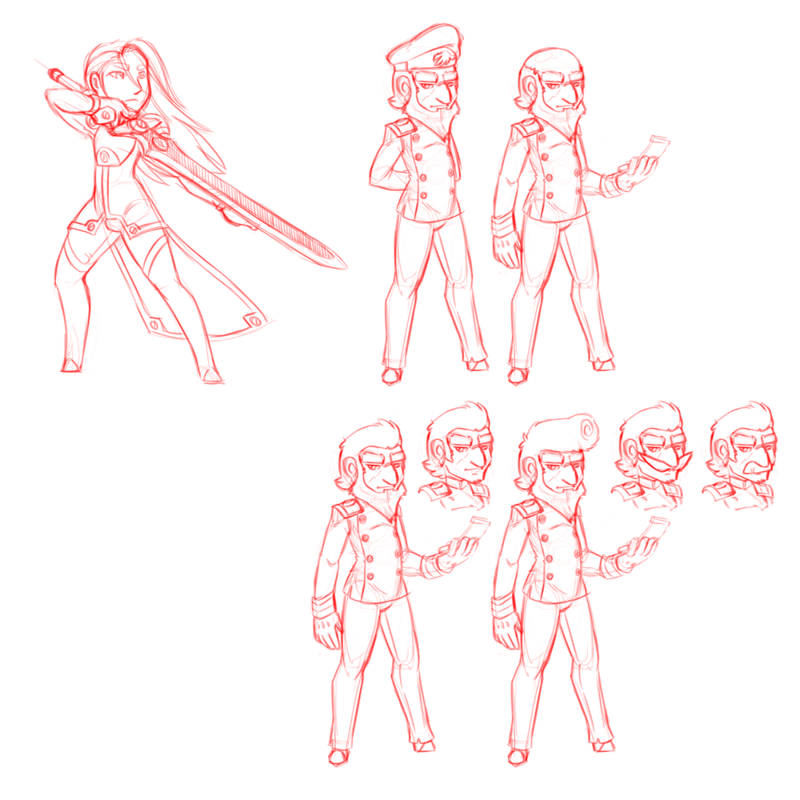 Then after that, I want to show off some concept art and ideas for things we want to put in the game. The form below has some simple questions that will give us an idea of where to go with Aether Tuesday content, so we can give you more of what you want to see; We'd greatly appreciate it if you would take a few minutes to fill it out for us! Your name. Feel free to use a pseudonym if you're uncomfortable sharing your real name. What are your favorite Aether Adrift races? Why do you find them the most interesting? Is there anything about Aether Adrift that you would like to know more of? Any questions or comments you have about us, the company, or the game. Alright, now that you've filled out and submitted the questionnaire (and definitely haven't simply skipped the form to look at the art) we can look at the art! Here we have a bishounen swordsman (So sugoi!). A very elegant swordsman that wields a giga blade with grace and finesse. He's a candidate for one of the iconic human characters. More importantly, however, is the Admiral next to him. That is the Admiral of the Albatross. I was sort of thinking of Jet from Cowboy Bebop while drawing him, and I'm pretty sure that's noticeable. He's not fully fleshed out yet, but he's a seasoned ship admiral, very experienced in taking ships between planets in the Sol system. These are some quick robot sketches to show off some of the unique features they can get during character creation. From left to right we have a Collapsible Arm Cannon, a Collapsible Arm Blade, 'Mobility Mode' Which lets them move faster with collapsible wheels in their feet or legs, and the Tow Hook which can be used to climb or to drag and lift things. The two pictures at the bottom are just a couple of faces. trying to get a feel for how robots should look, because it's been a little inconsistent. And, the last image for today, we have what we're calling a mimic slime. They're little gooey boys that seem to like to mimic the shape of other creatures and thinks they can see. Here we have a mimic slime impersonating a fulgori scientist while he takes notes. That's all for today, Voyagers! I can't wait to see what you all have to say! See you next Aether Tuesday! Newer Post[Aether Tuesday] The Things You Wanted To See More Of! Older PostHappy Valentines Day from Demonskunk Studios!